Are your cabinets starting to show their age? Would you like to bring your kitchen into the present century … without the major expense of replacing all the cabinetry? Don’t worry, it can be done. 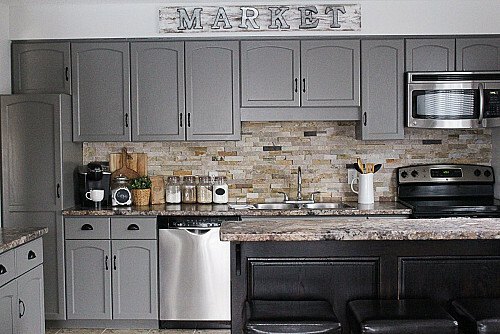 Check out these inspiring suggestions for how to make old cabinets look modern. Condition. Carefully assess the condition of your cabinets. If the doors are ugly, faded, or damaged (due to heat, moisture, and age) but the boxes – the part that’s attached to the wall – are sound, the cabinets are good candidates for a facelift. However, if the boxes themselves are in bad shape, you may need to completely replace the cabinetry. Material. 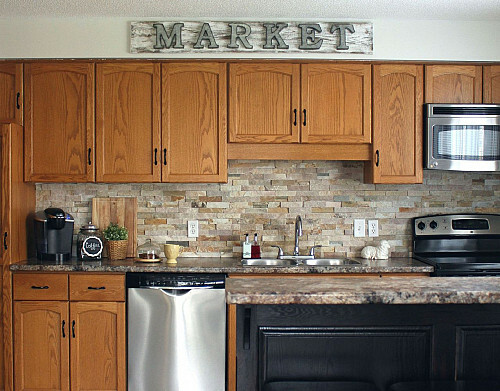 Two kitchen cabinet materials that shout “90s nostalgia!” are oak wood and cheap thermofoil. While the thermofoil of a few decades back often has problems beyond outdated style (like peeling and delamination) which may require replacement of either the doors or the entire cabinet, oak usually withstands the test of time. It just needs a modern tweak. Style. There was an era – not so long ago -- when “more is more” was the prevailing kitchen theme. Now the aesthetic is a lot simpler. If your cabinets feature intricate cathedral patterning or other signs of outdated style, a change is overdue, not to mention easy to DIY. How to make old cabinets look modern? An indirect approach – updating other features – will often work wonders without the need even to touch your cabinets. Paint the room. Paint the kitchen walls (and ceiling while you’re at it!) instead of cabinetry. If you’re trying to downplay orange-toned wood cabinets, choose a paint color with subtle contrast, such as charcoal or lavender. Avoid cream, yellow, and – obviously -- orange. Add a backsplash. Similar to painting, addition or replacement of a backsplash distracts the eye from less-than-lovely cabinets. Choose a clean, contemporary tile – run, don’t walk, from elaborate tile mosaics! Terrazzo is making a comeback and can coordinate beautifully with your cabinet color. Before making any upgrades, get those cabinets squeaky clean. Scrub off every bit of grease with TSP. Coordinate your new cabinet look with existing appliances and furniture, as well as any woodwork sharing the same space (especially in an open-plan kitchen/living/dining area). To update cabinet style, add strips of plywood or MDF to create “Shaker” doors on a budget. Or fill in an outdated engraved design with putty. Then cover your handiwork with paint.